Vogels believes that it is not possible to run a service 100% all the time – Systems Just Fail. Running infrastructure, services and applications that require a guaranteed up-time tend to be a complex game. We simply cannot have a perfect and ideal system, but we can try to tell when something is about to happen and do something about it. This is where Operating System Monitoring Tools and Software come into play. Although computers are designed to check their own resources periodically and self-heal, sometimes unexpected code errors in software or high temperature due to malfunctioning hardware can impact a system’s resources. The need to implement an all-in-one OS “Operating System” monitoring software and solution is necessary to minimizes those failures. An OS Monitoring Tool will collect periodic information from core components, analyze it and display the results in real-time graphics. As soon as an event is triggered, they will alert you so you can work on the problem. Windows XP, Vista, 7, 8, 10, 2008 Server, 2012 Server, 2016 Server, Linux, UNIX, and Mac Osx. Windows WMI (Exchange Server and Microsoft SQL Server). Redhat Enterprise Linux, Suse Linux Enterprise Server, CentOS, etc. Others: Citrix XenServer, Hyper-V Server, etc. A process can either reduce or increase the CPU overall consumption. A process could enter a hung state due to errors in the code and increase the usage of the CPU, leading to a potential rise in temperature. 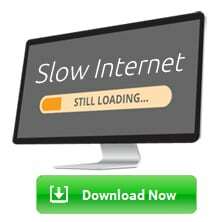 A faulty network adapter, incorrect switch settings, protocol failures or faulty hardware can affect the network bandwidth and even entire traffic in the network. Excessive memory usage could also impact an OS. For example, too much cache usage (% of memory) can lead to a performance crash. High average response times could indicate a faulty physical disk. Swapping to available partitions and freeing space on the volume are common responses. These are the records for your network security. If something is suspicious or if there is an error, the logs will register the event in the background. A monitoring tool can alert you when a critical service is paused, running, stopped or terminated. Some important services to check in a Windows Server are Active Directory, DHCP, Sendmail, Plug and Play Service. Some monitoring tools are tailored to check on the app itself, such as Apache, MySQL, IIS, etc. and any other important features of a Operating System that needs to be carefully managed and monitored (Registry, Systems Files, etc). Below you'll find a quick description of each Software suite as well as a few screenshots of their Dashboards, Cost/Pricing and Download links for each. 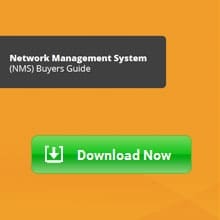 NPM is simply one of the best network management tools on the market. 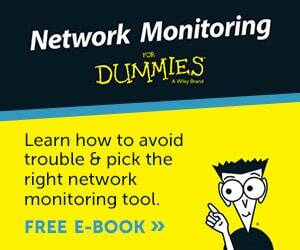 It is a very simple-to-use and intuitive network monitoring software. 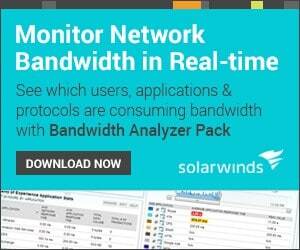 SolarWinds’s NPM is compatible with many vendors, such as Cisco, Microsoft, Linux, IBM, etc. 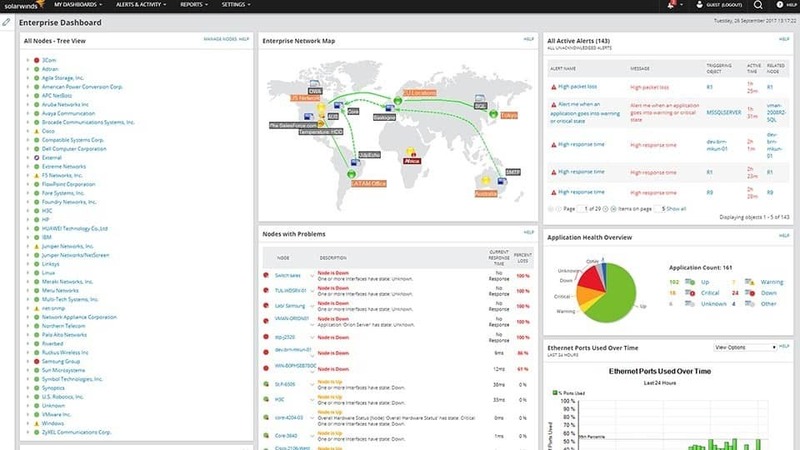 It can monitor availability, performance, and faults on a network. NPM can let you find the root cause of any fault quickly with its smart topology-aware network alerting system. To help maintain networks healthy, NPM shows you an auto-updating map with all entities and their relationships. For Operating System Monitoring, NPM has the ability to montior every single aspect of an OS and help you pinpoint issues before they become a problem! 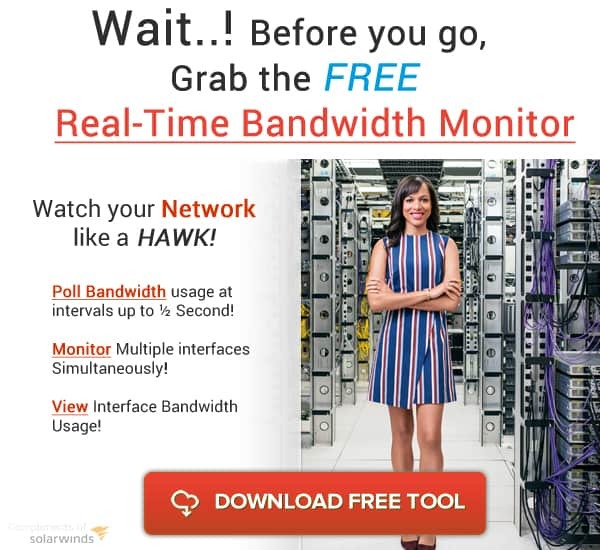 Solarwinds Server and Application Monitor (SAM) tool is an around excellent tool for getting a deep dive into monitoring any Operating System you can imagine. 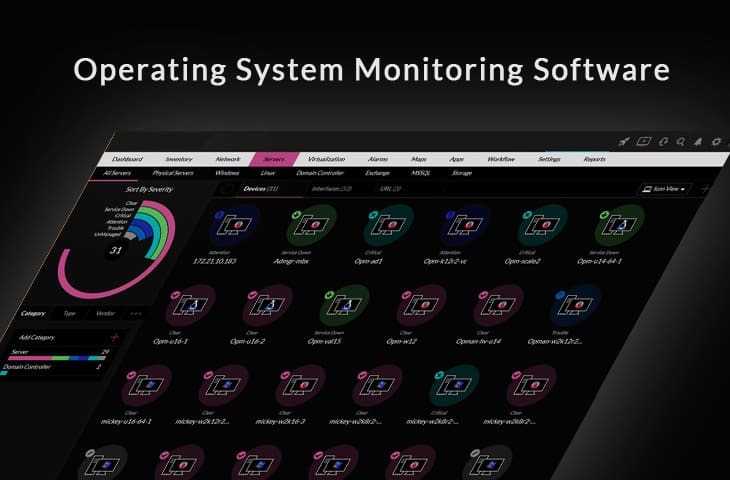 We over 1200+ Services, Programs and Software OS's that you can monitor, this is by Far one of the most versatile OS monitoring Solutions on the Market. We Suggest you download the Free Trial Below to get Started Immediately, you'll have 30 Days FREE to try it out and see how Well it works in your Environment! OpManager/Server Monitor is a monitoring tool for servers, important applications, processes, and services. The tool uses WMI and SNMP protocols to constantly monitor the server’s availability. Out-of-the-box, OpManager can monitor around 300 performance metrics, such as processor queue length, memory, free physical memory, disk I/O, etc. 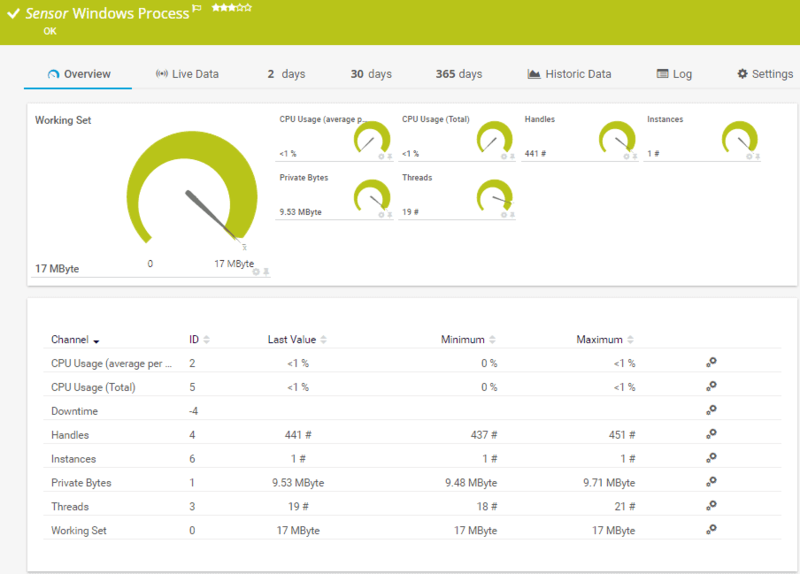 You can check these metrics through recorded logs or with its graphical view in real time. You can also be alerted of any event and create advanced reports. PRTG by Paessler is another Industry Titan in the Network Monitoring and Mangement realm, but they also do well in monitoring specific operating system vitals, services and critical components. As you can see, PRTG is very flexible and has really made an effort to cover as many OS's as possible in their Mangement and Monitoring Platform. They have a FREE 100 Sensor Fully Functional download as well, so head over to their Site below and download today! 5. Nagios: Operating System Monitoring. Nagios XI OS monitoring tool provides an extensive functionality for checking desktop and server OSs. Nagios works on Windows, Linux, Unix, OSx, Solaris, AIX, and HP-UX. It can monitor your system’s performance counters, services and process states, event logs, specific applications (such as IIS, MySQL, etc), and services. When an event is undergoing, Nagios uses its proactive alarming system to alert managers. Nagios Core FREE and Nagios XI $1,995 with a 60 Day Trial offer! 6. Quest: Foglight for Operating Systems. A tool used by midsize to enterprise businesses to monitor the performance across different operating systems. Foglight can monitor servers, databases, network devices, virtual systems, applications, etc. With Foglight you can quickly find issues and analyze their root cause with the help of the real-time graphics of the OS processes. The tool will collect some of the most important metrics such as storage capacity, I/O users, memory and CPU utilization, and create alarms and events if these metrics reach a certain threshold. 7. 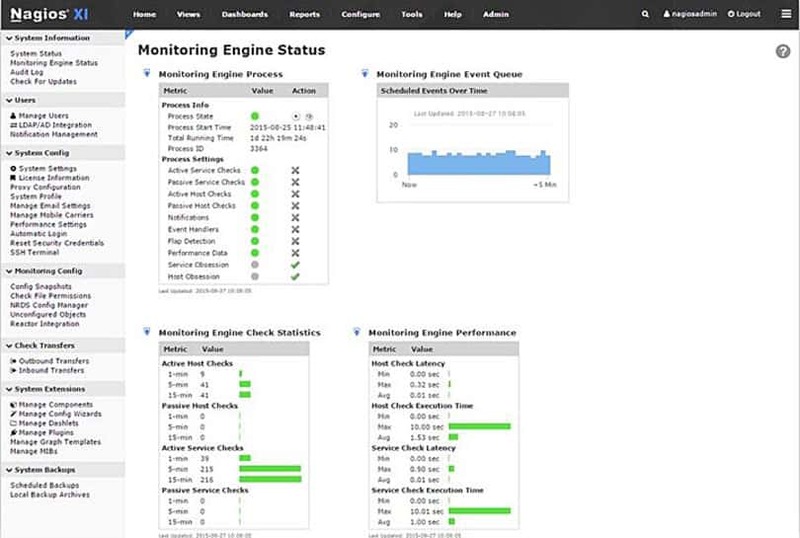 EventSentry: System Health Monitoring. System Health Monitoring checks the most important aspects of different servers to make sure that they are healthy and running smooth. This tool can help a systems administrator know the health of a computer by analyzing different core components such as physical disk space, services, processes, scheduled tasks, applications, and hardware. 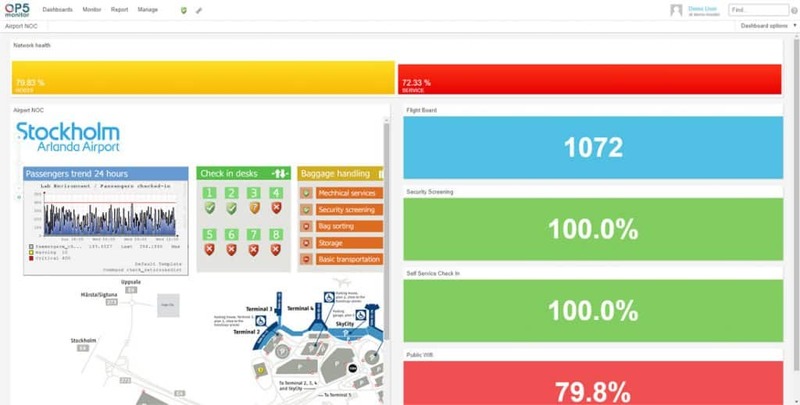 EventSentry’s System Health Monitoring collects data in real time, analyzes it and immediately raises alarms if necessary. The tool can also gather history information and predict trends on the system. 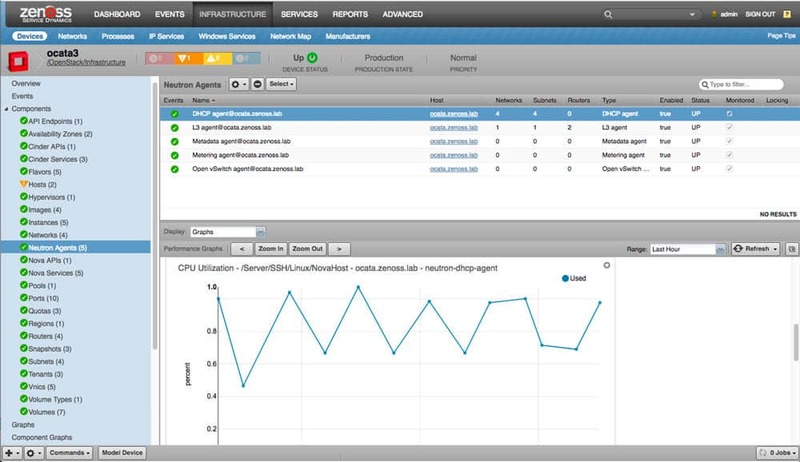 Server Monitoring from Zenoss checks and analyses the performance of servers in real time. It can help systems administrators monitor a large selection of different OS vendors, such as Microsoft, Oracle, HP, Dell, Cisco, IBM, Linux, in a single dashboard. 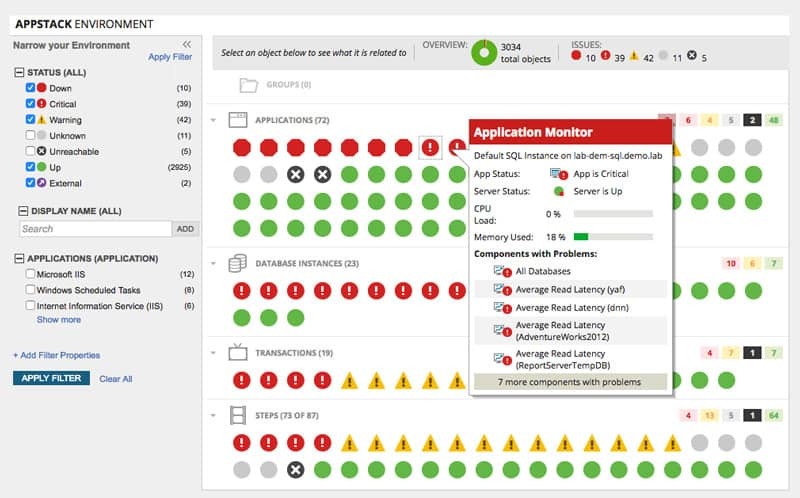 Zenoss, Server Monitoring tool can gather information on core components like, physical disks, processors, memory cards, interface throughput, and monitor them periodically. 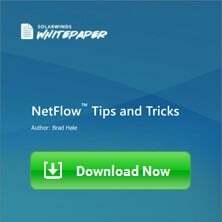 The tool will also auto-discover network elements as they come and go and keep them in a centralized networking inventory. This product is based on the open source project Nagios, and it’s developed by OP5. 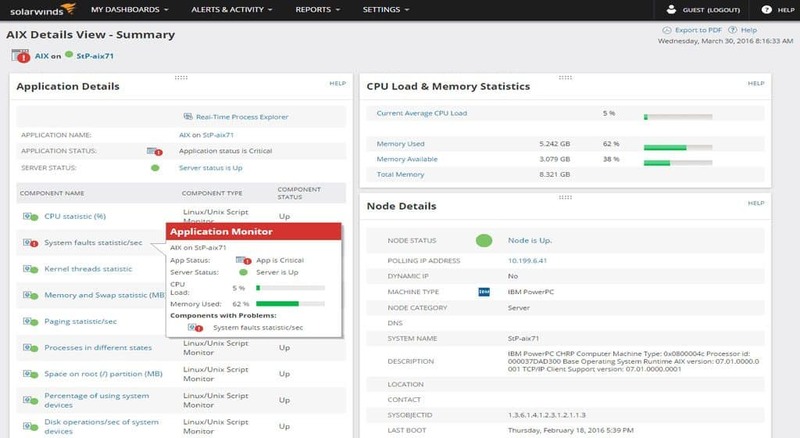 The OP5 Monitor is a monitoring tool designed to check servers, applications, networks, and storage (whether is on-premise, hybrid, or in the cloud). It can show the performance and health of the entire network in its interactive dashboard, and log all events with the OP5 Logger. With OP5 Monitor you can also gain full control of distributed IT environments in a single place. Among its most useful features are reporting and alerting, SNMP traps, log server monitoring, management packs, and automatic self-healing. Operating Systems are not vulnerable to failures, but getting 1 step ahead of them doing so on your Watch is a step in the right direction. Malfunctioning processes and OS services could increase the load on the CPU, which in turn could put the fans to work hard, which in turn could increase the temperature of the processor… it is an endless cycle. The Best OS Monitoring Tools will not solve the problem… but it will help you pinpoint the issue before a real catastrophe occurs and maintain your systems healthy.